I was torn. Should I write about Andrei Rublev this week? I had thoughts that I was collecting into something resembling cohesive, but then I realized that it's still the Christmas season, so I changed course and decided to write about something more appropriate for this time of year, the ultra-violent action film from 2012, Dredd. The comic Judge Dredd was made into a film once before as an action vehicle for Sylvester Stallone in the 90s. It's not a complete disaster of a film, but it's surprisingly flat, carries a lot of 90s cheese, and has a shocking amount of Rob Schneider in it. It never turned into the franchise that the studio wanted, so the property disappeared from the cineplexes. More than a decade later, DNA Films got the rights to the property and hired Alex Garland, the screenwriter for 28 Days Later, to write the screenplay. Karl Urban, the star of the film, has gone on to say that Garland actually directed the movie instead of the credited director, Pete Travis, although my guess is that Garland and Travis split the duties a bit (ala George Miller and George Ogilvie on Mad Max Beyond Thunderdome). Garland apparently went through a few ideas ranging from deep dives into the mythology of the character to what we finally got: a project of modest scope that leaves out a lot of the larger world building stuff that many comic book fans surely wanted to see. What we, the audience, received from Garland's work, was one of the most rewatchable, enjoyable, and effective action movies of the last couple of decades. And no one went to see it in theaters. Including me. One of the things that I think makes the movie work so well is its narrow scope. The comic has been around since the 80s and, like most comic books, has developed a rather large bevy of characters to go along with the intricate history of the universe. Garland eschewed all of that, focused almost solely on the central character, Judge Dredd. We don't get long explanations of how the world dominated by Mega Cities came about. They are simply there. We don't get intricate discussions of the machinations of the police state. It just simply is in control. The movie establishes all that the audience needs to understand about the world (the Mega Cities, the Judges, crime, chaos) in the opening three minutes or so with a voiceover and montage. Essentially, it’s the film saying, "Here's the universe this story takes place in. You can accept it or not, but now let's actually get to the story." In a movie world where everything remotely close to franchise worthy is trying to lay groundwork for sequels, this is extremely refreshing. I think of The Mummy, the confused and nearly unwatchable Tom Cruise vehicle from last year that spent a solid half of its running time trying to establish the Dark Universe for Universal. Dredd, by sidestepping world-building, gets to spend more time with its characters, plot, style, and theme (the four major elements of narrative) than with stuff that isn't nearly as important to the story at hand. In Mega City One, a new drug is hitting the streets called Slo-Mo. The manufacturer of the drug, a kingpin named MaMa, publicly executes three rogue dealers in her Mega Block, drawing the attention of Judge Dredd and his trainee Anderson. Once inside, the two judges get trapped and have to fight their way up the two-hundred story structure to confront MaMa, reclaim their freedom, and deliver justice. It's extremely similar to The Raid: Redemption, which has led to some accusations of plagiarism from some fans of The Raid, but Dredd was in production almost a year before The Raid first hit theaters. When most people think of Dredd, I doubt that they think of the film as some great achievement in creating characters. It's all about the exploding heads and weird slow-motion effects, right? Well, the movie's secret is that the violence carries weight because there's very solid character work going into it. It's not that the characters all go through massive changes. In fact, they largely stay the same through it all, but they are so well defined that when they get thrown together, the way they react to each other is what drives the action and makes it compelling. I see that there are three characters that are the most prominent in the film: Dredd, Anderson, and MaMa. Dredd himself is shockingly interesting considering the fact that he scowls all the time and we never even see his full face. His first scene is a chase and action sequence where we watch him apply the law in his status as a judge in this dystopian vision. He requires no backup. He pursues his objectives coolly but is unafraid of appropriately raising the stakes when the situation calls for it. He's completely no-nonsense and hardened, efficiently issuing out judgment. He's also willing to end a live in the name of justice. That's the groundwork that leads to everything that comes afterwards. The adventure that Dredd finds himself in takes him through Hell, testing him in every way. Physically, he's beaten down. He's challenged by an army of criminals, turncoat judges, and even his own partner (in a different manner than the others). What we watch is this clearly defined personality navigate the challenges he faces, and since he's so well-drawn as a character, there's a surprising amount of interest generated by him. Judge Anderson is a trainee who marginally failed her exams to join the force, but has strong psychic powers that allow her to read minds. Because the Judges are losing the battle for the city against the gangs, the Chief Judge assigns her to Dredd to see if her psychic powers add enough to the mix in the field to counteract her marginal fail. Anderson is a polar opposite to Dredd in every way. She's short where he's tall. She's skinny where he's broad. We never see his face, but she only wears her mask once, instead sporting a shocking sprout of blonde hair that contrasts starkly with her black and red uniform. She's also brand new where he's a long-time veteran of the force. The way the two of them play off of each other is great. At the beginning, Anderson largely follows Dredd. He points, she goes. He asks a question, she answers. He demands a judgment, she provides it. It's very much a mentor-mentee relationship at the start, but the desperation of their overall situation (their fight ever-upwards) creates situations where Anderson's psychic ability and her slightly more lax attitude to the application of the law (only in specific circumstances) actually helps the pair to win. Dredd begins the film thinking little of her ("It's not marginal. She failed," he explains to the Chief Judge) to finding her worthy of the badge ("She's a pass."). I'm not the biggest Lena Headey fan, but I absolutely love her as MaMa, the former prostitute who unmanned her pimp, took over his organization, and became so ruthlessly violent that she was able to completely take over Peach Trees, the Mega Block of tens of thousands of people. She plays MaMa really quietly. When she's really angry, her voice rises to a normal level, but most of the time she speaks almost in whispers. And yet, the look in her eye when she wants to do violence is really strong. There's a minor character played by Domhnall Gleeson (above) who runs her tech operation. When he first shuts the block down from the outside world, he's speaking over the phone to someone outside the block, trying to convince them to initiate the lockdown. All the time, MaMa sits quietly in the background, her facial scars red on her face, and her gaze locked coldly onto him. Since she's not actually the focus of the action, her presence is a little easy to miss, but once you see her there, you know that if he screws up and doesn't deliver, she's going to gut him. So, we have this hard as nails (but quiet as a mouse) woman/drug lord who had the misfortune of getting the attention of Judge Dredd with her public execution (with seventeen thousand violent crimes reported every day, Judges respond to four percent total) trying to manage the situation she created. Her penchant for violence comes to the fore early and often as she skins people alive and threatens the lives of every person and the next generation of their family for helping the Judges. When Dredd and MaMa finally face each other at the end, it's obvious that neither will budge. The movie doesn't end with the bad guy dying because that's how action movies end, it ends with Dredd killing MaMa because their personalities and situations are so diametrically opposed to each other that neither can exist at the same time. So, that's not why most people say that they love Dredd. They love it for the action. And the action is really good. What gives the action weight is the character stuff accounted for above, but what gives the action its awesomeness are the use of visuals. The most obvious of these is the Slo-Mo effect. It's not just slow-motion, but extremely slow with a bright, glittery effect that sells the idea that this drug is quite the trip. Seeing bullets tear through bodies with the effects going is really quite striking. Here, have a look! That leads me to mention how bright and colorful the film can be. As an audience, we're used to post-apocalyptic visions of the future turn dour and de-saturated, like every action movie about a dystopia carries the same thematic and intellectual weight as 1984. This isn't a dig on Dredd, but the fact that Garland and Travis weren't afraid of using splashes of color all over the place to help fill the world makes the film simply more interested to simply look at. 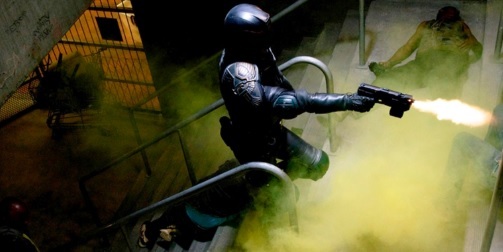 From the bright reds of gunfire, to the multi-colored ads and computer screens, to the deep blues and greens of the medical bay, and to the neon colors of the smoke Dredd uses to cover his movements, all give the audience just that much more to look at in every moment. Bright colors in a future setting don't do everything (just watch The Zero Theorem to dispel yourself of that notion), but it certainly does help give the eye something to look at other than drab walls. There are those out there who have very narrow definitions of what makes a good story. It must entertain first and foremost and the notion that something like Andrei Rublev is a good movie is heresy. 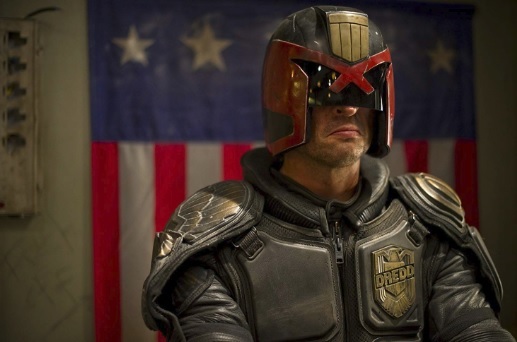 There are others who demand morals, and the idea that a movie like Dredd, which never questions the fascist police state that it portrays (as Manohla Dargis of The New York Times complained), is an abomination and must be shunned. Me? I just want whatever the movie is offering. If it has the modest ambition to entertain me, that's fine with me. If it wants to elevate me and present me moral questions, then I'm game for that as well. I bring this up because I do think that Dredd is not only a great movie, but may be one of the great movies of the past decade. Its modest scope gives the film a chance to not only hit the right notes, but to do so with style and verve on its relatively limited budget. It's pulse-poundingly good fun and with more than enough character depth to give weight to the proceedings. My only regret is that I didn't see it in theaters where it bombed, and we never got Garland's vision for his Dredd trilogy.